140 years ago Adolf Schonbek, a young glass maker, decided in incorporate is prodigious craftsmanship skills with the world of lighting fixtures. The result was Crystal Lighting Fixtures that were sought after worldwide. 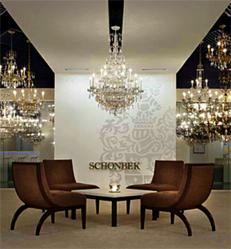 Since then, Schonbek has become the most recognizable names in Crystal Lighting and has solidified their name as the industry leader in all forms of high-end lighting. In recent years, Crystal Lighting has moved outside of the traditional genre. Integrating contemporary designs and the use of various shapes and colors has transformed the common notions of lighting design. Schonbek International, in collaboration with Swarovski Crystals since 2007, has been at the forefront of these innovative times. Entering the Schonbek/Swarovski Showroom at the Dallas International Lighting Market, it is clear that these prestigious companies understand the motion of the crystal lighting industry more than others. In fact, they are generally the trend setters. Collections such as the Schonbek Geometrix line have set the mark to follow with their pioneering approach to geometric shapes, colors, reflections, and refraction. Littman’s description of these crystal pieces truly illustrates the genius behind the partnership between Schonbek and Swarovski. Producing fixtures that are nothing less than perfect, Swarovski employs numerous methods of precision crystal cutting. The patented Elements Crystal is a premium method of crystal cutting that integrates various shapes, sizes, and colors creating a pristine, machine cut product that can only be found on Schonbek products. While browsing the numerous patented crystal styles offered by Swarovski and displayed only on Schonbek fixtures, it is clear that this partnership with certainly set the bar for crystal manufacturing and lighting designs in high end lighting.